Below you will find a few highlights of coursework from my PR Writing and Production, Bradley Lab student-run agency, Publication Design and Production and Research and Methods classes. I am confident that the skills that I have learned in all of these classes will help me in my future career. In this class, I learned how to create professional public relations writing in a variety of formats (posters, blog posts, press releases social media content, direct mail packages, infographics and videos). Our fictional client for the semester was Chobani, America's number one Greek yogurt producer. I took this optional "class" to gain more real world experience. I was an Account Executive and managed a team of five other students. Our client was Allstate, the largest publicly held personal lines property insurer in America. I served as the primary liaison between Allstate upper level management and our team I conducted primary and secondary research that addressed the client's need of finding more agents in the state of Utah. Our final product was a comprehensive Utah Entrepreneurial Strategic Plan. Our team presented this report to Allstate senior level management. In this class, I learned how to design specifically for publications and strengthened my Adobe InDesign skills in the process. 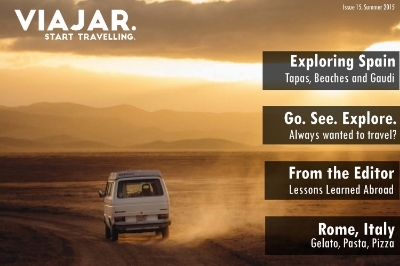 See my final project, a six page interactive iPad magazine called Viajar, by clicking the image below. In this class, I learned about various research methods critical to the development of strategic public relations campaigns. The class particularly emphasized focus group/survey approaches with qualitative and quantitative statistical analysis. Our client, Infomercials, Inc., based in Springville, Utah, came to us wanting research about the direction of the infomercials and direct response industry. Our findings were comprised into a final report, which was then presented to Infomercials, Inc. senior level management.